Trump has signaled he will withdraw from the agreement by May 12 if it is not renegotiated and changed. TEHRAN, Iran — Iran's foreign minister took to YouTube on Thursday to criticize President Donald Trump's threat to withdraw from the nuclear deal, saying Iran will not "renegotiate or add onto" the atomic accord. Mohammad Javad Zarif's video, which was also posted to Trump's favorite social media platform, Twitter, appeared to be taking his message to the masses after earlier speaking to news outlets across the United States to defend the deal. It comes as Trump has signaled he will withdraw from the agreement by May 12 if it is not renegotiated and changed. Those changes have included proposals to limit Iran's ballistic missile program, which Tehran says it has as a defensive deterrent. 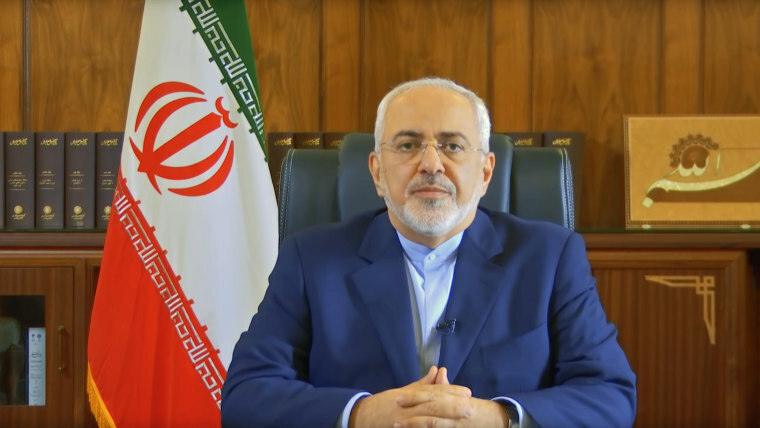 The five-minute video shows Zarif behind his desk, delivering his message on the deal. He offers background first about the deal before laying into Trump and criticizing Europe for offering "the United States more concessions from our pocket." "On 11 occasions since, the U.N. nuclear watchdog has confirmed that Iran has implemented all of its obligations," Zarif, who studied in the U.S., says in American-accented English. "In contrast, the U.S. has consistently violated the agreement, especially by bullying others from doing business with Iran." Zarif adds: "Let me make it absolutely clear once and for all: We will neither outsource our security nor will we renegotiate or add onto a deal we have already implemented in good faith." There was no immediate response from Washington. Zarif's video comes amid intense lobbying on Trump from all sides. Israeli Prime Minister Benjamin Netanyahu claimed with great fanfare on Monday that he had "new and conclusive" proof that the Iranians had lied about ending their nuclear program. However, the information he unveiled has largely been known to American intelligence agencies for years, two U.S. intelligence officials told NBC News. Most analysts believe Netanyahu's speech — in English with giant visual aids — was not trying to persuade American analysts or diplomats. He was trying to influence an audience of one: Trump, who already has denounced the nuclear deal and expressed a desire to end it. Zarif himself dismissed Netanyahu's presentation as "a rehash of old allegations" and called the prime minister "the boy who can't stop crying wolf." In the video, he also appears to troll Trump, saying: "To put it in real-estate terms, when you buy a house and move your family in it or demolish it to build a skyscraper, you cannot come back two years later and renegotiate the price." If Trump refuses to continue waiving sanctions on Iran next week — most likely before the May 12 deadline — U.S. sanctions would be re-imposed on Iran. Iran could then say that the U.S. is in violation of the terms and that it is free to resume nuclear work. European leaders spoke over the weekend about last-minute attempts to get Trump to stick with it for a while longer or at least not tear it up completely, sources told NBC News. Diplomatic sources say that there is a small chance of a compromise but that they are fairly certain Trump will not go along with postponing a decision any longer. Andrea Mitchell and Ken Dilanian contributed.